On a glorious sunny day, we are in the countryside around Piacenza, between the Po River and the Tidone River, and reach the dairy of the same name: Caseificio Val Tidone. It was established in 1967 with the aim of bringing together the milk from 25 dairy farms to produce Grana Padano. They have been producing the cheese for 50 years now, using local milk from cows that receive the greatest care in terms of their diet and their health, as required by the production specifications. The milk is taken to the dairy immediately after milking, and it is processed within 24 hours and turned into Grana Padano, Ricotta and Butter. Here to tell us about the dairy is Mr. Opizzi, the Chief Executive, and the cheesemaker Raffaello. Sitting around a table we chat about all kinds of things and discover that they were born on the same day of the same year and have been working together since 1991. Fortunately they get on very well, and even manage to take some time off between jobs. Also in the same room is Daniela, who is vacuum packing the cheese that she will then sell at the dairy shop. Besides the shop, she also manages the dairy's presence at an important local event, the Fiera dell'Angelo fair, which is held in Borgonovo Val Tidone every Easter day and Easter Monday and attracts hosts of visitors. The event showcases countless local food and drink specialities, such as wines, cured meats and cheeses, including of course Grana Padano! There is also an opportunity to visit the nearby Castle of Castelnovo. 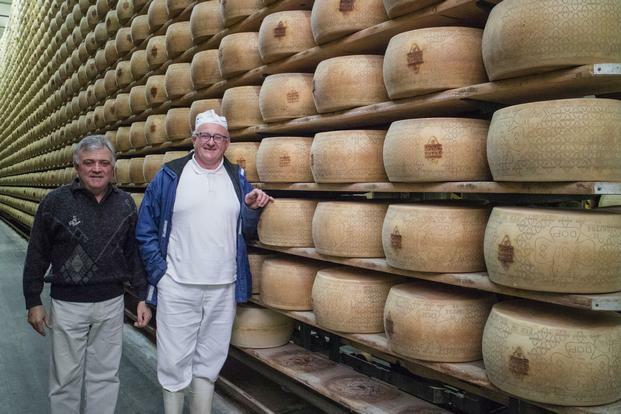 Finally, we are taken on a tour of the dairy by Mr. Opizzi and the cheesemaker Raffaello, who tell us about a nasty incident that occurred a few years ago, in which the previous cheesemaker and his wife were taken hostage by a gang of thieves who stole a load of Grana Padano wheels. They subsequently installed a more powerful burglar alarm to avoid such an incident from happening again. Now that everything is under control they can sleep easy and the Grana Padano can mature in peace!